My husband and I are basically obsessed with our Weber Kettle Grill . We are grilling anything and everything. I was previously obsessed with my pizza stone but it has unfortunately fallen out of favor. I have also been excited with the opportunity to repurpose my 8 inch parchment rounds that I bought for all the cakes I never made. Cupcakes are just superior to a layer cake! The parchment really makes the shaping of the pizzas and the transfer to the grill much easier. The recipe below is just the basics to get you started. You can be creative with toppings. 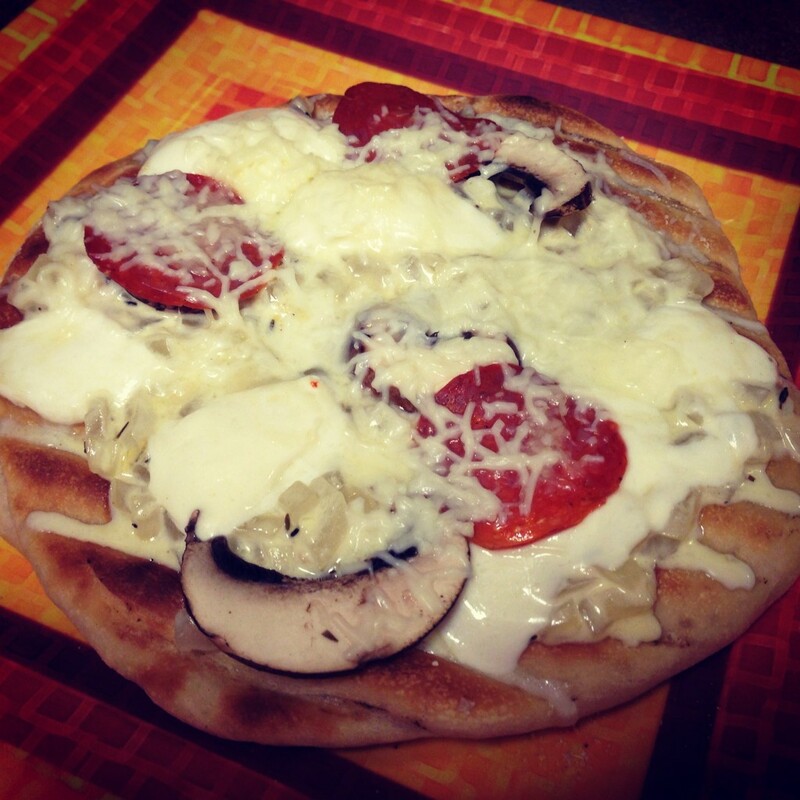 Unfortunately my pictures are not the best because we could not help but to immediately slice and taste these pizzas. Be careful here, it is easy to overcook the pizzas. It takes just 2-3 minutes for each side of the pizza. This technique of grilling one side and then placing the toppings on the grilled side allows you to cook the pizzas evenly. Use plenty of olive oil to prevent sticking. 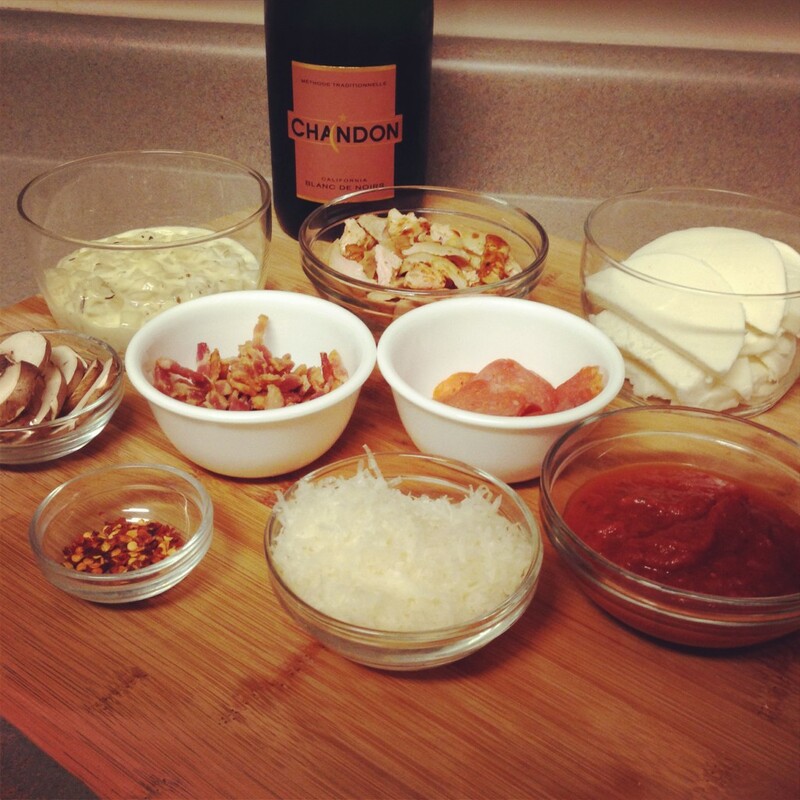 We enjoyed our grilled pizza night with a bottle of Chandon Blanc de Noir. This is a rich sparkling made from Pinot Noir and Pinot Meunier grapes. It really complements the flavors of grilled foods. You can serve this light pink sparkling wine with any food that you might traditionally serve alongside a still pinot noir wine. In the bowl of a stand mixer, combine the yeast and honey with warm water (110 degrees). Wait 10 minutes until bubbles form and it gets foamy (see bubbly yeast to the left). Add in salt, oil and half the flour. Using the dough hook, mix to combine. Once the flour is mixed in, add in the rest of the flour bit by bit until combined. The dough should be tacky but should not stick to your hand. You may need to add more flour, add this 1 tbsp at a time. Knead the dough with the mixer on a medium to high setting for 7 minutes. The mixer bowl will be clean after 7 minutes. Use olive oil to lightly grease the dough and the bowl. Cover with a warm towel and allow the dough to rise for 1 1/2 hours, or until doubled in size. 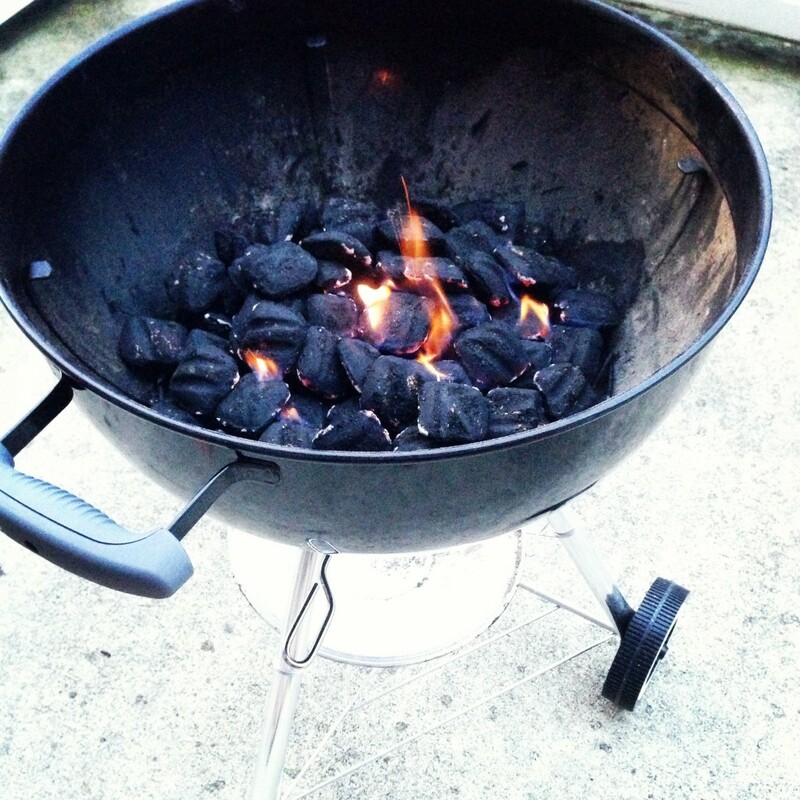 Light the grill. When using charcoal, you will want this to be a “hot” fire. You should not be able to hold your hand over the heat 5 inches from the grill for more than 3 seconds. Prepare a pizza peal or baking sheet with sprinkled corn meal. Cut the parchment paper into 8 inch circles and coat them lightly with olive oil. Divide the dough into 3 equal pieces, you can use a scale for accuracy. Shape it into a ball and stretch the outer edges with your hands forming it into a disk that is almost the size of your parchment circles. If the dough is too stick, use some olive oil on your hands. 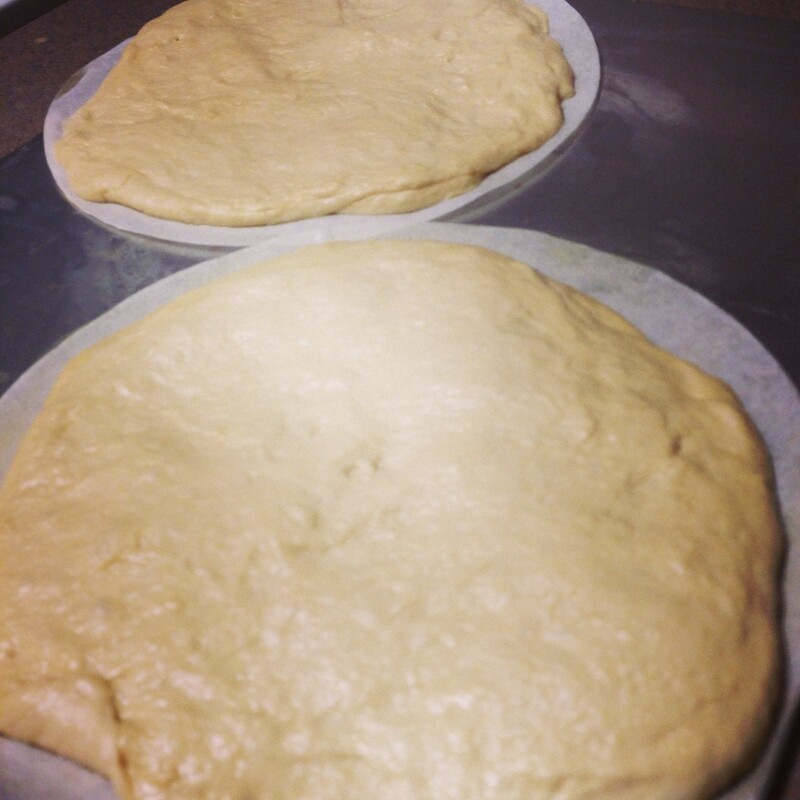 Place the dough on the parchment and continue to stretch it to the edges. 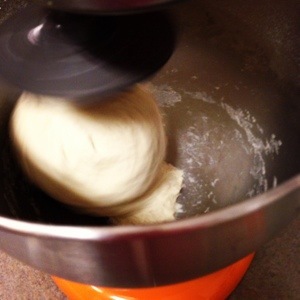 Lightly coat the surface of the dough with olive oil. Flip the dough onto the hot grill, remove the parchment paper. Replace the lid and let this cook for 2 minutes. After 2 minutes, check the dough, it should be crispy with grill marks. Transfer the dough to your prepared pizza peal, grilled side up. To the grilled surface of the pizza, apply your sauce, red pepper flakes, parmesan, toppings and mozzarella. Yes, in that order. Be careful not to overload the pizzas with sauce and toppings. Transfer the dough back to the grill with the uncooked side facing the coals. Replace the lid and cook for 2 more minutes, or until the bottom begins to char. This is mac and cheese innovation. You can serve mac and cheese at parties or at your tailgate and no one needs a fork! I even served them at Thanksgiving. The cheese sauce here has an amazing flavor that beats all other recipes. And I don’t think I have to say it, but proscuitto is an amazing complement to mac and cheese. You will be surprised at how quickly these come together. Serve these with something bubbly, like Friexenet Cava. Bring 4 quarts of salted water to a boil. Add the pasta and cook untilal dente, based on the package directions. Drain the past and reserve 1/4 cup pasta water. Preheat oven to 375 degrees. Place each slice of proscuitto in each muffin well, lining the bottom and edges. In a small frying pan melt one tbsp butter over medium heat. Add the panko and cook, stirring occasionally, for 5 minutes until browned and toasted. Remove from the stove and set aside. Melt 2 tbsp butter in a large sauce pan on medium low heat. Add in the flour and stir constantly. Cook the flour for 2-3 minutes until slightly brown in color. Whisk in the milk slowly and continue whisking out any lumps. Cook for 7 minutes, simmering, until thickened. Remove from heat. Add in the cheeses, mustard, sriracha, salt and pepper. Mix cheese sauce into the noodles. 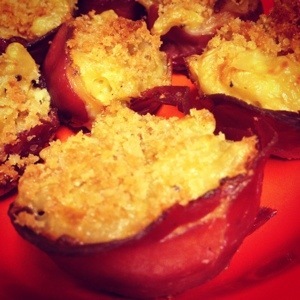 Scoop the macaroni and cheese into the prepared muffin wells. Sprinkle with the panko. Bake for 25 minutes. I can’t believe we are halfway through September! The best part is that I only have 9 days left of horrifying ICU hours and I can get back to important things, like baking and blogging. Football season is well underway which means lots of at home gatherings. I wanted to throw together ground beef tacos the other day but had no shells or tortillas. 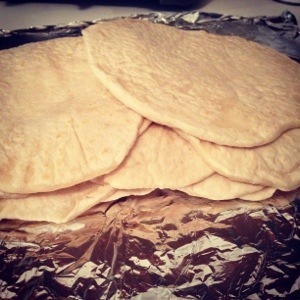 After making these homemade tortillas, I will never settle for store bought. The fresh flavor is unmatched. They are truly simple to create and well worth the time. And you don’t need a tortilla press! Sometimes the dough can be troublesome to roll out, so just let it rest a minute and try again. I froze half of my tortillas and they were just as delicious a few weeks later. My husband made breakfast burritos with the leftover tortillas and they could not have tasted more delicious. In the bowl of your food processor with the dough attachment, combine the flour, baking powder, salt, and shortening. Pulse until the mixture is crumbly, 5 seconds. Scrape down the bowl. With the food processor running, slowly pour the water into the mixture in a steady stream. Add just enough water that the dough forms a ball. Process for 30 seconds more to knead the dough. Add flour if the dough is too sticky. Place the dough onto a lightly floured counter and divide into 12 equal pieces. (I weigh them to be precise with this awesome scale .) Cover with a clean kitchen towel and let rest for 10 minutes. Heat a large skillet on medium heat. Pat one dough ball at a time into a disk with flour and roll into a thin circle, approximately 8 inches diameter. Place the tortilla into a heated skillet and cook each side for 10-20 seconds, until lightly browned. Do not over cook! Repeat with each dough ball. Store in an airtight container for up to one week. The full amount of this dip can disappear in 10 minutes when presented to as many as 3 grown men. Luckily it takes minutes to prepare. This is best served with tortilla chips, carrots, and celery. Fresh tomatoes from the garden make this dip fabulous. But I also keep a can of petite diced tomatoes around to throw this queso together. You can actually quarter the tomato and onion and use your food processor to dice them. This dip pairs quite well with a light beer in the summer. I have also served this with merlot. Sauté onion with olive oil in a medium skillet over medium heat. Cook, stirring occasionally, until the onion is translucent, 8-10 minutes. Add the diced tomatoes and green chiles. Sprinkle with salt. Sauté 5 more minutes until some of the liquid reduces. Reduce heat to low. 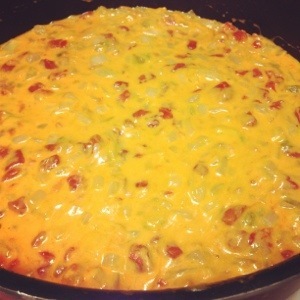 Add in the cheeses, stir constantly until melted. Add in the sriracha, stir to combine. I have tried many different recipes, some involving a food processor, some by hand. But this recipe made in a stand mixer produces great results every time. This recipe will make 1 pound of pizza dough, two 12 inch crusts. I almost always make a double recipe. You can store the extra dough in the refrigerator or in the freezer. The dough actually gets more chewy after being refrigerated. If you’re having people over for game day, you can make this days ahead. Pizza is obviously versatile. Tomato sauce, turkey pepperoni, parmesan and mozzarella can be thrown on this dough in 5 minutes. I bake my pizzas on a stone which is preheated in a 500 degree oven. This recipe calls for bread flour. It is important to use bread flour because of the protein content. I use King Arthur brand which is 12.7% protein. King Arthur all purpose flour is 11.7 % protein which is on the high end compared to other all purpose flours which are 10% to 12%. Cake flour is around 8%. The significance is in the gluten. Gluten is what gives the texture to your pizza dough, and anything else you bake. Higher protein means more gluten and chewy dough. You create these gluten bonds when you knead the dough. Or as in this recipe, when your stand mixer kneads the dough. This is an original recipe from the Bubbly Kitchen.